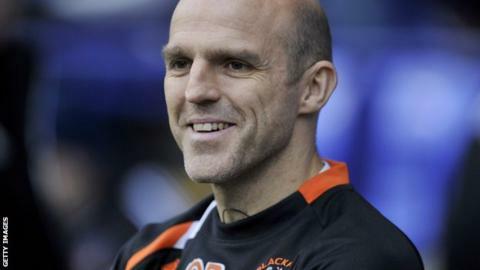 Former Rangers and Wolves midfielder Alex Rae has become St Mirren manager after signing an 18-month contract. The 46-year-old, who met the Scottish Championship club's board on Friday morning, succeeds Ian Murray, who resigned on Saturday. Rae left Genk in the summer, having been assistant manager to Alex McLeish at the Belgian top-flight club. It will be his second stint as a manager in his own right, having had a two-year spell at Dundee from 2006. The Press Association has reported that Buddies chairman Stewart Gilmour originally wanted to hand Rae a short-term contract until the end of the season. But a statement on the club's official website said: "The new manager has signed a deal that will see him take charge until at least the summer of 2017." Rae's spell at Dundee was also in Scotland's second tier and he takes over in Paisley with the Buddies sitting third bottom ahead of Saturday's visit to bottom side Alloa Athletic. Murray's six-month reign ended after a defeat by Dumbarton, the club he left in the summer to replace Gary Teale, who was sacked following St Mirren's relegation from the top flight. Rae was appointed player-manager at Dens Park in May 2006 and they finished third then second in the old First Division in his first two seasons in charge. However, having already retired from playing, he was sacked as manager in October 2008 with his side sitting eighth in the table. He joined Milton Keynes Dons as first-team coach under Paul Ince and then moved to Notts County and Blackpool as assistant manager to the former England midfielder. After Ince was sacked in January 2014, Rae teamed up with McLeish at Genk until the former Scotland manager left the Belgian club in the summer. Rae's playing career began with Falkirk and he subsequently was on the books of Millwall, Sunderland, Wolverhampton Wanderers and Rangers before he joined Dundee. He briefly revived his playing career as cover for injuries while with MK Dons.